We've all had that feeling of anticipation in the movie theater when the lights go down and the first musical notes start issuing from the loudspeakers. The magic is about to start, and you're going to be part of it. Home Theater is the technology that lets you create that same magic in your own living space by combining high quality video and state-of-the-art sound. The good news is that it's a lot simpler to accomplish this than you might think. So, exactly what do you need for a home theater, anyway? To start with, you need a television or video display of some sort. While you can technically get away with a smaller picture of less than 30 inches, much of the impact of a movie theater experience will be lost on such a small screen. 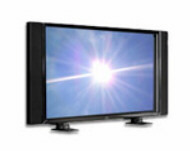 Therefore, you'll probably want a larger LCD or plasma display in the 40 to 60 inch range or even a front projector capable of creating an 8 to 10 foot image that really gives the visual impact of a movie theater. But remember, size alone isn't everything. Picture quality varies tremendously among brands, and clarity, black levels, color saturation, gray scale, and absence of motion artifacts become increasingly important as image size increases. Next, you'll need to consider the audio portion of the system. Home theater requires a minimum of 5 loudspeakers, front left and right, center, and rear left and right. Technically, a subwoofer is optional, but you won't get the full impact of those impressive sound effects without one unless your front loudspeakers are quite large with extended bass capability. If you're using smaller bookshelf or on-wall/in-wall loudspeakers, the subwoofer becomes mandatory. Those smaller loudspeakers just don't have enough bass to do the system justice. These 5 loudspeakers plus the subwoofer comprise a 5.1 system. You can expand this to a 7.1 system with two extra ambience loudspeakers placed at the sides and to the rear of the listening area. 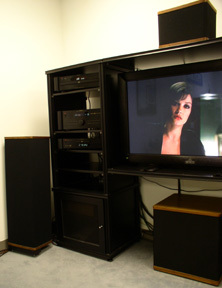 The front left and right loudspeakers carry most of the main program material except for the dialogue of a movie. These are also the speakers that will play music when you are listening to a CD. They should be placed to the left and right of the video display with a separation similar to your seating distance from them. These are very important loudspeakers and should consume a significant portion of your audio budget. The center channel carries all of the movie dialogue and, thus, is one of the most important loudspeakers in a home theater setup. If at all possible, it should be from the same manufacturer as the front left and right loudspeakers so that it matches their sonic characteristics and blends with them. It is normally placed just above or below the video display. Having a good center channel is particularly important for viewers who are to the left and right of the center of the video display. The center channel will help keep the dialogue centered on the screen for these off-center viewers. The subwoofer, of course, reproduces the deepest bass of both music and movie sound effects. The best location for the subwoofer is near the front loudspeakers, centered between them, if possible. Contrary to popular wisdom, the subwoofer does not perform equally well in any room location despite the fact that its radiation pattern is omnidirectional. To sound correct, the bass tones emanating from the subwoofer must blend smoothly with the rest of the music coming from your front speakers. If the distances and directions from the subwoofer and the front channels to the listening area are very different, this blending cannot happen properly, and the bass will be poorly-integrated with the rest of the sound. If you put that subwoofer next to your elbow so it can double as a coffee table, your going to hear the bass thumping along next to you while the rest of the sound comes from the front of the room. The rear loudspeakers are normally placed behind the listeners on the rear wall. They can be floor-standing, bookshelf, in-ceiling, or on-wall/in-wall models. In some rooms, it may not be possible to have them behind the listeners, and locating them on the side walls is an acceptable alternative. The rear loudspeakers mainly reproduce ambient sounds and sound effects for movies, so they are not as important as the front loudspeakers. Therefore, some people prefer to put less money into the rear channels than their front speakers. However, the rear loudspeakers should, if possible, be from the same brand as the front channels. If this isn't possible, they should be chosen to have similar sonic characteristics to the front channels. The (optional) side loudspeakers, used in a 7.1 system, are placed on the side walls and to the rear of the listening area. These can supply some additional ambient sound but are only usable if your electronics support a 7.1 configuration. If your room has required you to place the rear loudspeakers on the side walls, then these side loudspeakers will not be appropriate, even if your electronics do have 7.1 capability. Next, you'll need some electronics. At a minimum this means a Blu-Ray player and a home theater receiver. The Blu-Ray player is used to play movies and feeds audio and video signals to the receiver and video display. (The Blu-Ray player can also be used to play your CDs, but, for the best possible CD sound quality, we recommend a separate CD player.) Your other input sources such as cable or satellite, VCR, and video games can also be connected to the home theater system, turning it into an exciting entertainment center for your entire family. The home theater receiver is the control center for the system, providing switching of sources, decoding of input signals from Blu-Ray players and other sources, and power to drive your loudspeakers. While most home theater receivers appear to have the controls and features needed for a home theater system, the sound quality varies significantly among different brands. Thus, the receiver should be selected for its audio quality, not just its features or power output. More sophisticated home theater systems will employ separate components (preamplifier/processor and multi-channel power amplifier) instead of a receiver. As with stereo systems, a higher level of performance is obtainable with separate components. As always, the trade-off is one of price vs. performance. Receivers cost less and take up less space while separates offer better sound at a higher price. Finally, it is most important that the audio and video parts of the system be in proper balance. You will, most likely, be very disappointed if you spend the majority of your money on the video display and don't leave enough for first-rate audio. Remember that movie directors use sound for both gross and subtle effects, creating suspense, excitement, fear, and many other emotions with their sound tracks. You will lose much of the movie's impact if your audio is not up to speed. How do you get all of these parameters balanced and integrated? Well, we think we can help you do that by working closely with you and considering your needs and the layout of your home theater room. Auditions in the store are, as always, the best way to decide on what components are right for your needs. A well-designed home theater centered around a large screen display can create a gathering place for your entire family and friends. Movies and concerts come alive, right in your own home, with the dramatic visual and sonic impact of a large theater. Whether you're watching a sporting event or your favorite movie, a well-designed home theater system will involve and excite you in a way that ordinary television just can't approach.